The Pitts S-2A I flew today is similar to this one, only all black. 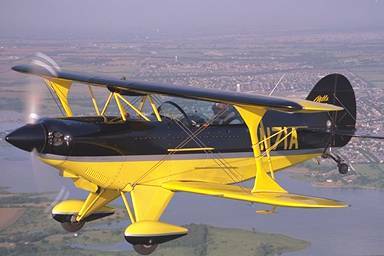 It's owned by John Greenwood, USAF Ret., who flies in airshows and gives aerobatics lessons. He likes to fly down the runway inverted at 20 feet, do a snap roll, chop the throttle, and land--stuff like that. He keeps the Pitts at Hanover County Airport, which I'd never flown at before, so even the location was new to me. We met at the terminal. He's a lean man, just under six feet and 67 years old. He briefed me on "today's mission," and we walked to his hangar. He showed me how to squeeze into the front seat of the Pitts and then helped me get strapped in. Parachute first, then five-point harness, then headset, and finally a second lap belt to hold the headset cord down across my lap. "You can't get those straps too tight," Greenwood said. The headset had a chin strap. That's when it really started to sink in--aw, jeez, this is serious business. He climbed in, fired up the engine, and taxied out to the runway. He'd already told me that he does all the takeoffs and landings, and I could see why--because you can't see the runway ahead at all, even from the front seat. I know about S-turns to see where you're going, but I hadn't imagined that even with S-turns you still can't see where you're going. The Pitts is so small that I don't think he could see ahead in those turns much better than I could. At the runway he ran it up and I tried to get tuned in to where the instruments were. Airspeed, altimeter, G-meter, rate of climb, manifold pressure. A bubble gauge for the ball in the top center of the panel. No turn indicator, no gyros (That didn't sink in until just a few minutes ago: gyros don't like to turn upside down.) Magnetic compass centered above the panel. Throttle up, we're rolling, still yawing from side to side until the tail comes up, and we're off, climbing steeply at 80 knots. At 500 feet he tells me to take it, says I'll need plenty of right rudder. At first I'm all over the sky. The stick doesn't need to be moved, just pressed on a little, but it's a minute or two before I get control over my arm muscles. But the ball is jammed all the way over to the right, so I stomp on the pedal. There's a smoke tank (I think) between my legs, and I have trouble getting much pressure on the right pedal at first because of it, but finally figure out how to work around it. Then things start smoothing out, and I'm getting the feel of it. Eventually I manage to get the airspeed back to 80 and we're in a more or less controlled climb again. "Level off at twenty five hundred," he says. We're at 2,500, so I level off immediately. He takes the airplane and trims it up, then gives it back to me. "Do a three hundred sixty degree turn to the right and then one to the left." I roll into a sixty degree turn, keeping the altitude easily enough, hoping to roll out more or less on the heading, but not sure because the mag compass isn't keeping up with the turn rate, so I just wait until I-95 comes back around to the left side. I roll out and keep rolling into a turn to the left, hold it, and roll out when the highway is in the right place again--I think. It could be on the wrong side for all I know by now. And... there endeth normal flight as I knew it. This next picture is sort of similar to what the world looked like for the rest of the lesson. Greenwood took back the airplane and did a slow roll to the right. Then he did a four-point roll to the right. Then he rolled upside down and held it for a while, telling me to look around and get used to the view. Well, hell, I was glad those straps were tight. "Where's the highway?" he said. I looked the wrong way, of course, and he cackled into the intercom, "See? I told you! They all look the wrong way at first!" Nice that he was confiding in me like that. He rolled rightsideup again and told me to follow him on the controls the next time. He rolled over again and got it level--if that's what you call it upside down. I was having trouble keeping my feet on the pedals, and my cheeks sagged up toward my eyes. "Okay, now, freeze the stick just like that and hold it there." Jesus. I couldn't see the horizon ahead because the top wing blocked my view. I tried looking "up"--which was down, of course, but all I could see was the ground--no horizon. "Look at the wingtips," he said. "See the horizon over there?" --aaaand that's when it suddenly got to me and I started sweating and feeling bad. I mumbled something into the intercom about straight and level for a minute. "Nope, that's all," Greenwood said. "We have five minutes to get on the ground." "I'll be okay in a minute." "No, you won't. Head back to the field." I didn't argue, but I felt worse about feeling sick than I did feeling sick. Naturally, I couldn't find the airfield. He reminded me gently that it was to the south and that we were heading north, so I turned around and managed to pick it out about five miles away. "We'll turn right at the end of the runway and fly across the numbers at a thousand feet." We were at 2,300 feet. Okay, I eased the throttle back to keep us in the bottom end of the yellow, and got us there right on the money, and turned crosswind. He took it on downwind and turned base almost at the end of the runway, making a tight pattern with the throttle back to idle and the draggy airplane sinking fast. The landing was a little bumpy--but he was in a hurry to keep to his "five minutes" timetable and to keep the front seat pukefree. He was right about the five mintues. I didn't kutz (one of my favorite Pennsylvania Dutch words), but I sure didn't feel comfortable. It's six hours later now, and I still don't feel comfortable. Greenwood had told me before we went up that everyone feels sick at first, but that it lasts only for two lessons and then it's gone forever. We'll see. My second chance at throwing up inside a Pitts is next Friday. This time it's in the morning, though, so I can feel sick all day. Because I've never thrown up in a Pitts? It was cool, though, trying to figure out what was what upside down. I've always gotten motionsick without trying. I think I got sick this time from looking from one wingtip to the other upsidedown. Or were we downsideup? In training they tell you that quick head motions causes vertigo--and I sure had plenty of that today. When I was on a troop ship coming back from Korea, the most popular guy was Roark. Guys were calling his name all over the ship--down G.I. cans, in the head, over the rail. Roark! Yeah,, I know, bad joke--but no worse than I felt on that damn boat for 18 days. Never did go looking for Roark, myself, that trip. Didn't care to get acquainted.